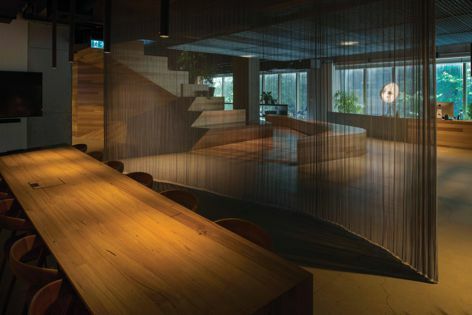 Transit wire mesh curtains provide spatial flexibility at Woods Bagot’s Melbourne office. When designing the interior spaces and reception area of its Melbourne office, Woods Bagot chose metal elements that provide flexibility and the ability to alter spaces at a moment’s notice, while adding an industrial tone. Locker’s Transit wire mesh curtains, installed on a curtain track, can be opened and closed and can be motorized or operated manually. Even in a closed format, the open area of the Transit curtain allows light to filter through, while creating privacy and intimate spaces.